On Everest as Sherpas mourn dead Jump to media player The avalanche on Mount Everest triggered by the Nepal earthquake highlights the risks that Sherpas take supporting climbers scaling the mountain. Climbers remain at Everest Base Camp Jump to media player The BBC's Ian Pannell reports from Everest Base Camp where a recovery operation is under way following Saturday's devastating earthquake. 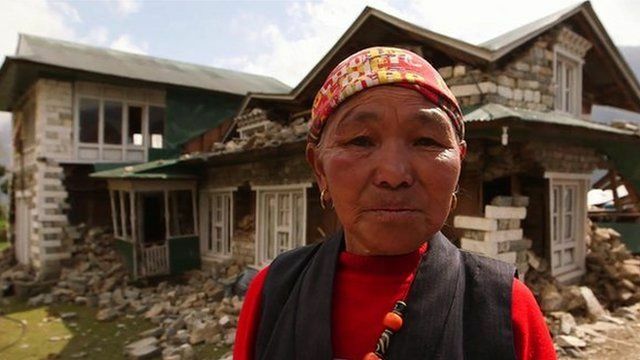 Two women who beat an earthquake Jump to media player Clive Myrie finds out what happened to two women, one British and one Nepali, who survived the Nepal earthquake. Tiny village becomes Everest rescue hub Jump to media player The small village of Lukla at the base of Mount Everest has become the centre for the rescue effort, following avalanches after the massive Nepal earthquake. Climbers on Mount Everest are often supported by teams of Sherpas who work as porters, guides and cooks. Many were caught up in the avalanche triggered by the Nepal earthquake and some lost their lives. The earthquake once again highlights the risks that Sherpas take in a bid to earn money to make a living. Ian Pannell went to Everest base camp and met Sherpas who have lost loved ones.